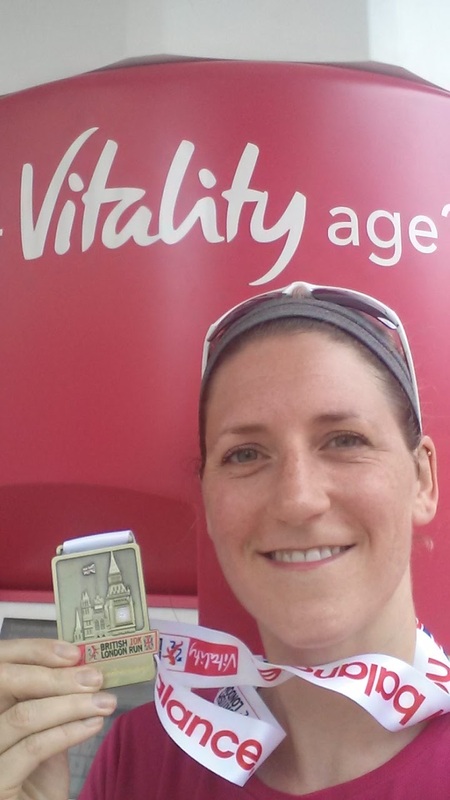 Last weekend, Vitality was kind enough to invite me to be part of their team for the 15th Anniversary Vitality British 10K. This meant breakfast at The Guards and Calvary Club overlooking the start line, a primo view of the warm up, and starting with the elites (I don't think I have ever started so close to a start line). 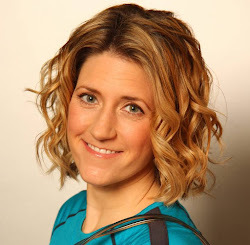 It was wonderful to catch up with Beki over scrambled eggs. Although a full breakfast was available, I only had a small amount as I didn't want to get a stitch during the race. We met a few other bloggers, as well as Vitality Ambassadors, at out table. Beki and I had a ton of photos taken of us and enjoyed dancing on the balcony during the warm up. it was awesome to have a bird's eye view of the crowd as they got more and more energized to start. The male winner was Assefa Bekele with a time of 29.44 (note this is a bit longer than it takes me to run a 5K). I asked Bekele if he was able to enjoy the sights even though he was running so fast. He said he recognized a few from watching the London Marathon. 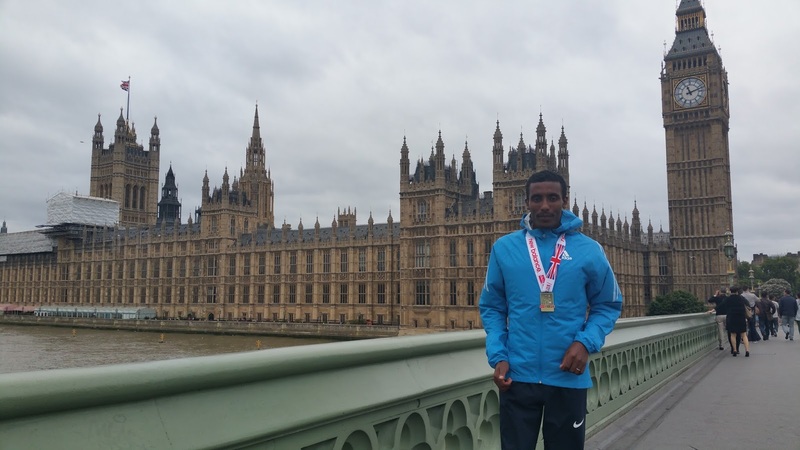 He also said he absolutely loved London and his first international victory outside his home country of Ethiopia. Female winner was Alice Braham with a time of 36.48. I nearly got a PB with 52:07. Looks like I have a long ways to go! 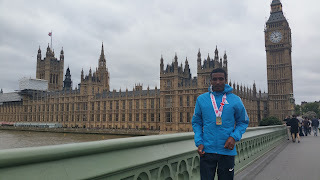 Male winner Assefa Bekele on Westminster Bridge after the race. Registration process & fees: Entry could be done online or via post. 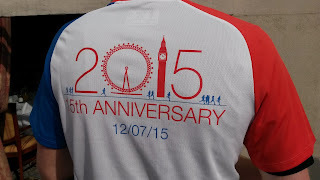 Fee was £50 and included a tech t-shirt posted to you before the race, chip timing, text message with result within 90-120 min of finishing, medal, official program 2015, commemorative finishers certificate download, 20% off Central London attractions for runners and guests, and free online training from RunCoach. I really liked the design of the shirt which highlighted the London Eye and Big Ben. 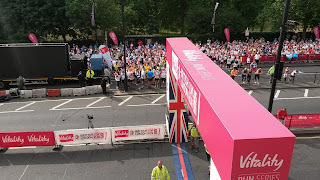 Location: Start line was within walking distance of Hype Park tube station, but the bag drop was between Piccadilly Circus and The Mall. Finish on Whitehall Rd near Downing Street. Course & bogs: The course was kind of a clover shape that took you past several London icons, such as Regent's Street, The Strand, Trafalgar Square, Piccadilly Circus, Westminster Abbey, and Big Ben. The streets were completely closed to traffic and wide enough for all 17,000+ runners (at least it was in the front where I started). There weren't any port-a-loos along the way from what I saw. The commemorative program listed alternative toilets to use before arriving. I only saw a few port-a-loos along the Mall before taking the steps up to Waterloo Place to reclaim bags. Unfortunately, there wasn't a water station until 5K, even though I am sure I heard someone say there would be one at 3K. From then on they were fairly frequent, including what seemed to be around 8K and 9K on Victoria Street. Atmosphere: There were a lot of people along the course looking out for friends and family. I always love to hear cheers as I run by. Plenty of kids were out cheering too and asking for high 5's from the runners. London is calm on a Sunday morning, especially without any traffic. It is a nice treat from the normal commotion you get in the city. Bling/goody bags: After crossing the finish line, everyone was given a bottle of water. 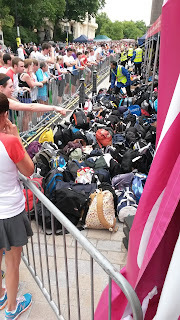 You then had to walk a good 10 min from the finish line outside Downing Street back through Trafalgar Square to the baggage claim to pick up a medal, but there weren't any signs or marshals to guide you. You got a medal when you picked up your bag or if you didn't have a bag, from a 'bling only' tent. No goody bags or snacks were available. Luckily, my bag was at the Vitality tent. The baggage area looked full to the brim with a lot of people waiting for their bags. I give credit to the volunteers who were trying to be as efficient as possible. Tips if you decide to take part next time: Add in a little bit of hill training as there are a few slight inclines that took me by surprise along the route. I would also suggest to take this run as a fun one so you can really enjoy the sites of London (especially if you don't live/work in the city) and not worry about a PB. There are many runners on the course so unless you are near the front, it might take you a while to reach the start line. Also, don't bring a black bag if you are going to use baggage check (this is true of any race). Go for one that stands out as it will be easier for the volunteers to pick out from the sea of bags. Pack a post-race recovery snack to have on the Tube ride home. I was given a complimentary race entry by Vitality. All opinions are honest and my own. 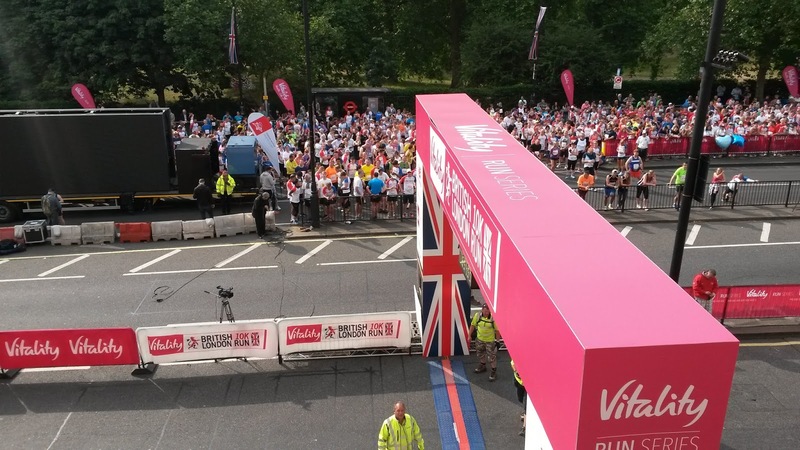 Vitality, the health and life insurance company that rewards people for being healthy, is the title sponsor of the Vitality British 10K London Run and is one of nine events in the Vitality Run Series.